"PreVedic refers to the date before the vedas first written and Sanskrit Language derived from other language "
Two lakh years old siva temple is discovered in America, The one who is behind the discovery is the researchers belongs to U .S. Museum of Natural History. The News related to this discovery of this siva temple is revealved in the News paper dated 23-11-1937. அமெரிக்காவில் இரண்டு இலட்சம் ஆண்டுகளுக்கு முற்பட்ட சிவன்கோயில் கண்டுபிடிக்கப் பெற்றுள்ளது. யு.எஸ்.மியூசியம் ஆஃப் நேச்சுரல் ஹிஸ்டரி ( U .S. Museum of Natural History ) என்ற அமைப்பைச் சேர்ந்த அறிவியல் அறிஞர்கள் கண்டுபிடித்த மிகத் தொன்மையான சிவன் கோவிலைப் பற்றிய செய்தியொன்று வெளிவந்துள்ளது. 23-11-1937 – இல் நியூஸ் ரிவ்யூ ஆஃப் லண்டன் (News Review of London) என்ற நாளேட்டில் அச் சிவன் கோயிலைப் பற்றிய செய்தி வந்துள்ளது. அமெரிக்காவில் மக்கள் செல்ல முடியாத கொலாராடோ என்ற மலைப்பகுதியில் “மறைந்து போன உலகம்” என்ற ஒன்றைக் கண்டுபிடித்துள்ளார்கள். அம் மலைப் பாறையின் மேல் ஏறக்குறைய அரை மைல் சதுரப் பரப்பில் பழைய சிவன் கோயில் கண்டுபிடிக்கப்பட்டுள்ளது. நில மட்டத்திலிருந்து ஏறக்குறைய 9 ஆயிரம் அடிக்கு மேல் மலைப் பாறையில் அச்சிவன் கோயில் அமைந்துள்ளது என்பது அந்நாளேட்டில் வந்த செய்தியாகும். Seals have been recovered with the repeated motif of a man sitting in a yogic position surrounded by animals. This is very similar to the Hindu god of Shiva, who is known to have been the friend of the animals and sat in a yogic position. These seals are known as the Shiva seals. 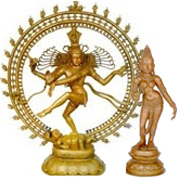 Other images of a male god have been found, thus indicating the existance of Shiva worship, which continues to be practiced today in India. The Aryan's were supposed to have destroyed many of the ancient cities right around 1500 B.C., and this would account for the decline of the Indus civilization. Parpola departs in this case from his own rules of rebus, which require the finding of anothermeaning for the same word ( * canil), and not for an associated term ( * pillay). Further as far as I know, there seems to be no attested usage in Dravidian for pillay by itself to mean 'squirrel'. The suffix pillai is added in Tamil to a wide variety of words to indicate the 'young of the species" and not specifically or even mainly to the squirrel. As regards the Gondi and Parji words for 'squirrel' cited by Parpola, the suggested derivation from * pillay is not supported by regular phonetic correspondences. 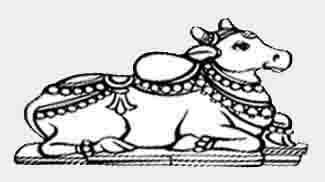 The Harappan "Proto-Siva" depicted on a seal from Mohenjo-daro. "Ellora, a decayed town in Hyderabad, derives its celebrity chiefly from the remarkable excavations in the neighboring mountain, known as the temples of Ellora. According to Hindoo legend, the date of these temples is carried back for a period of 7950 years, and their origin ascribed to Rajah Eeloo, the son of Peshfont, of Ellichpore, when 3000 years of the Dwarpa Yoag were yet unaccomplished. The more rational account of the Mohammedans states that the 'town of Ellora was built by Rajah Eel, who also excavated the temples, Rajah Eel was contemporary with Shah Momin Arif,' who lived 950 years ago. According to Elphinstone, however, the first mention in history of these caves occurs in connection with the Princess Dewal Devi, daughter of the Rajah of Guzerat, who was captured by a party who had gone from the camp of Alp Khan to visit the excavations at Ellora. "Elephanta, in the presidency of Bombay, is a small island on the east side of the harbor of Bombay, and distant about five miles from the mainland. It is something less than size miles in circumference, and is composed of two long hills, with a narrow valley between them. The usual landing-place is toward the south, where the valley is broadest. Some distance to the right of the landing-place is a large clumsy figure of an elephant, cut out of an insulated black rock; and from this circumstance the island (which by the natives is called Gara-pori) has derived the denomination by which it is known to Europeans. "This huge figure, which is thirteen feet in length, is represented as much mutilated and rapidly sinking into total decay, its head and neck having in 1814 fallen from the rest of the body, which was also fast coming to the ground, an extensive fissure having taken place in the back. On advancing farther from the landing-place, the visitor comes suddenly in front of the grand entrance of a magnificent temples, whose huge massy columns seem to give support to the whole mountain whicn rises above it, and out of which it is hewn. The entrance is by a spacious front, supported by two ponderous pillars and two pilasters, forming three openings, under a thick and steep rock, overhung by brushwood; and the impression on reaching the interior is rendered very deep and solemn by the long ranges of columns that appear closing in perspective on every side; the flat roof of solid rock that seems to be prevented from falling only by the massive pillars whose capitals are pressed down and flattened, as if by the superincumbent weight; the darkness that obscures the interior of the temple, which is dimly lighted only from the entrances; and the gloomy appearance of the gigantic stone figures ranged along the wall, and hewn out of the living rock. "There are three principal parts in this extraordinary work - the great temples, 133 feet broad and 130 1/2 feet long, and two smaller temples, one on each side of the principal one. These two appendant temples do not range in a straight line with the front of the principal one, but recede considerably from it, being approached by two narrow passes in the hill, one on each side of the grand entrance, but at some distance therefrom. Each of ehse passes conducts also to a side front of the grand excavation, exactly like the principal front, consisting of two huge pillars with two pilasters. These two side fronts are precisely opposite to each other, on the east and west, the grand entrance facing north; and the plan is regular, there being eight pillars and pilasters in a line from the northern entrance to the southern extremity, and the same number from the eastern to the western entrance." Ruins of a fire temple dating back to the Sassanid era have recently been discovered during a series of archaeological excavations in the Vigol region near Kashan in central Iran. The discovery was made during the latest season of excavations, which are being carried out by a team of archaeologists led by Mohsen Javeri and began in mid-June, the Cultural Heritage, Tourism and Handicrafts Organization announced in a press release on Monday. The cruciform temple has four entrances leading to the ruins of a fireplace embellished with unique stucco designs, Javeri said. The team has also unearthed pieces of ornate stucco work at the foot of the fireplace, he added. The fire temple floor has been covered with plaster. The walls of the mud structure have been decorated with plaster dado rails, above which they have been painted with ocher paint. The archaeologists surmise that the fire temple was used during the period after the fall of the Sassanid Empire due to the fact that the plaster on the fire temple floor has been recovered several times. "This kind of the Sassanid religious architecture has previously been found in southern Iran, but this first time such a structure with these characteristics has been identified in central Iran," Javeri noted. The fire temple is located in one of the two Sassanid cities, which were identified in the region in 2005. Javery said that the cities, which are almost intact, are buried under the sands. Upcoming studies on the cities could shed light on the transition from the Sassanid era to the Islamic period and urbanism during the early Islamic eras in the region, he stated. The Vigol region is located at a distance of about seven kilometers northeast of the city of Kashan in Isfahan Province.